Every month on the third Thursday. 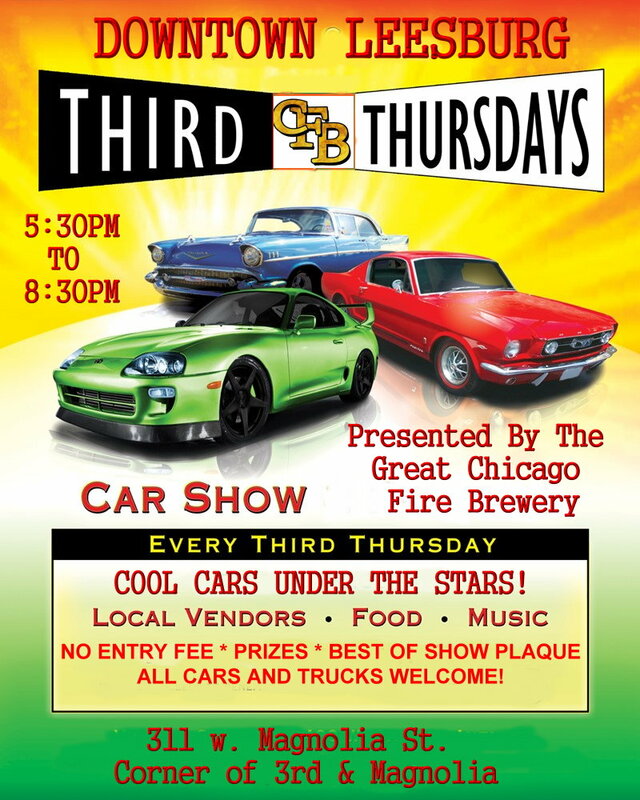 Come on out to the Great Chicago Fire Brewery & Tap Room, Leesburg Florida Florida monthly car show; Cool Cars Under the Stars in the city parking lot directly across the street from us. Brought to you by the new Leesburg Street Cruisers Car Club. We are looking forward to making this a bigger and even better event each month. The event is in a well lit, spacious parking lot. There is also great exposure from Main Street in historic downtown Leesburg on the corner of 3rd and Magnolia Street. Open for all cars, trucks and bikes. Our DJ plays all the hits you love. Great Chicago style food, pizza and more. Plenty of domestic and craft beers, craft spirits and ice cold soda to choose from. This event is open to everyone young and old. There will be a “Best of Show” plaque along with other prizes, so bring your ride out and show it off (no entry fee required) or just come out and enjoy the cars on display and have some fun. Great sponsorship opportunities available with DJ mentions and social media advertisement.